Corthell House and Barn in West Laramie (no longer in the Corthell family). Nellis Eugene Corthell arrived in Laramie in 1881 from Franklinville, New York. He worked on ranches and studied law in the office of Col. Stephen W. Downey. Corthell was admitted to the bar in 1883. From 1887-1888, Corthell served as the county’s prosecuting attorney at a time when Albany County extended north to the Montana line. He had an outstanding legal career for 50 years, including appearances before the U.S. Supreme Court. Locally, Corthell served on the Albany County Board of Commissioners, as county Democratic chairman, and on the Laramie school board. He was also president of the Pioneer Canal Company, a partner in a plaster mill, and owner of the Laramie Boomerang from 1890 to 1911. His wife, Eleanor Quackenbush Corthell, came to Laramie in 1882 from Black River Falls, Wisconsin. She taught at the newly opened Rock Creek school 50 miles north of Laramie before transferring to the new west side school in Laramie. Eleanor met the young law student at a social function and they married in 1885. Together, they reared seven children including Evelyn, Morris, Miriam, Gladys, Robin, Huron, and Irving. Eleanor was active in numerous civic and community affairs. She was a charter member of the Laramie woman’s club in 1898 and active in the Women’s Christian Temperance Union, as well as the First Baptist Church Ladies Aid organization. For many years she collected good books, made portable shelves and supplied these books to rural schools. She organized the first West Laramie community club and a girl’s sewing club. Eleanor had a great love for the outdoors and natural beauty of Wyoming; in the summer of 1903 she departed in a wagon with her seven children for a two-month-long overland trip to Yellowstone. She chronicled their many adventures in a book she titled, A Family Trek to the Yellowstone. The Corthell family lived at 815 Grand Avenue for 24 years before moving to a new farmstead on the Corthell farm in West Laramie. The liveliness of their children and numerous grandchildren filled both homes. 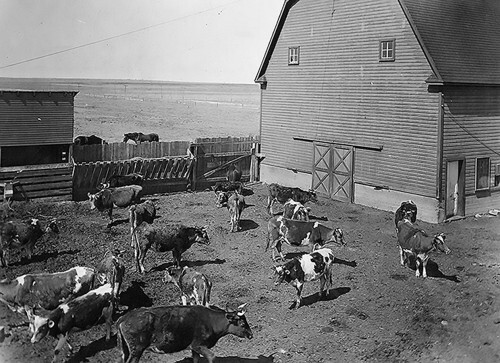 The Corthells’ home on Grand (now occupied by their great-granddaughter), as well as the house and barn in West Laramie still stand today. Nellis Corthell died in 1938 after a long and brilliant career in law and civic affairs. Photo and information courtesy of Ann Mullen Boelter, member of the family. Learn more about Nellis and Eleanor Corthell.